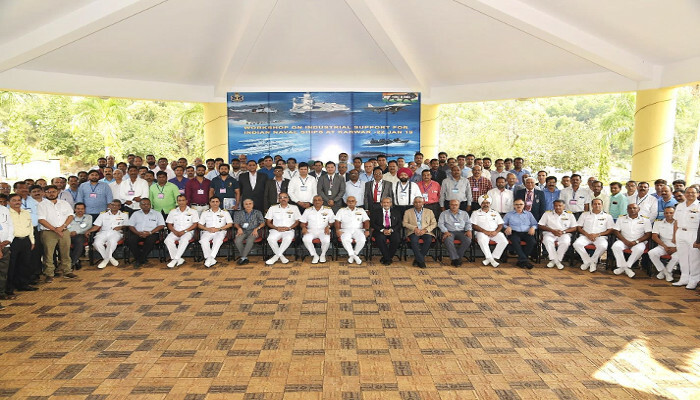 A workshop on Industrial Support for Indian Naval Ships based at Karwar was conducted on 22 January 2019 at Naval base, Karwar. The workshop was organised by Headquarters Karnataka Naval Area. Rear Admiral KJ Kumar VSM, Flag Officer Commanding Karnataka Naval Area, chaired the workshop. The workshop was attended by 150 delegates from all over the country, which also included Senior Officers from Naval Headquarters and Western Naval Command. The aim of the workshop was to broaden the horizon of industries based in and around Karwar, by way of providing opportunity to participate in repairs and maintenance of shipborne equipment. As a part of this workshop, a series of presentations were shown to the delegates which covered diverse nature of equipment fitted onboard Indian Naval ships and bringing out the opportunities for their repair and maintenance were highlighted. All the delegates were explained the procedure for vendor registration with Indian Navy. Faculty from National Institute of Technology, Suratkal attended the workshop and appreciated that students will get involved in finding solutions to the problems faced by the ships through Research and Development. All delegates were also given insight about the procedure for indigenisation of equipment and Inspection and Quality Assurance Procedures by Chief Quality Assurance Establishment. Subsequent to this Workshop, Indian Navy organised a visit to the ships in order to apprise all delegates with their requirement and need for indigenisation for better technical support. Mr Atul Jadhav, Mentor CII Goa Logistics panel appreciated the efforts by Indian Navy and said “A very good initiative by the Ministry of Defence especially Indian Navy. This is a positive response and approach towards the Government’s policy of giving an opportunity to new players from the private sector particularly in the shipbuilding, ship repair and service industry.” This was organised for the first time in Karwar wherein the vendors and Academia were assembled together for the industry support and enhancing Make in India. Mr Vinay Javali, Honrary Secretary Karnataka Chamber of Commerce and Industry, welcomed the Indian Navy’s initiative to develop the naval facility of Western Naval Command. “This will create opportunities in abundance to local MSME to develop themselves as successful vendors for the Navy. Prospects of local trade and industries is promising in coming years and will definitely have positive impact on per capita income at large. Congratulations and due regards for a successful vendor development programme held on 22 January 2019,” he said.